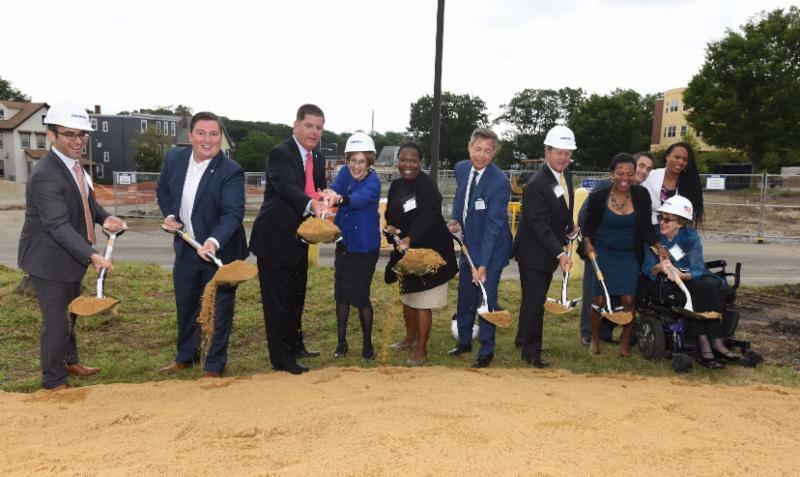 BOSTON - Tuesday, August 8, 2017 - Mayor Martin J. Walsh today joined State Senator Linda Dorcena Forry, developers The Boston Home and Affirmative Investments, local elected officials and members of the disability community for the Harmon Apartments groundbreaking. The $15.4 million project will create 36 units of accessible mixed-income housing with supportive services designed to promote independence for adults with significant disabilities. "Our goal in Boston is to create a city that works for everyone -- and that includes creating homes that are affordable, accessible, and allow our residents to live independently," said Mayor Walsh. "I thank all the partners involved in this equitable housing development. This innovative solution for needed accessible supportive housing is a snapshot of the progress we're making citywide. It takes a team to move our housing goals forward, and I'm proud of Boston's commitment to this project, and to our commitment to keeping Boston a diverse city where all are welcome." "Mayor Walsh cares deeply about the quality of life for all residents of the City of Boston," said Marva Serotkin, President and CEO of The Boston Home. "Mayor Walsh has promoted housing with supportive services for those among us who need just a little extra assistance to fully engage in this vibrant city. From his early days as State Representative, he has been a friend of the residents of The Boston Home along with Senator Linda Dorcena Forry and other elected officials. The extraordinary collaboration and leadership among City, State, private and philanthropic investors have been essential in making Harmon Apartments a reality." Harmon Apartments will be located at 2045 Dorchester Avenue in Dorchester and will be an urban residence with amenities in close proximity to local businesses just two blocks from the accessible MBTA Redline Ashmont Station, and adjacent to a bus stop. Common space to accommodate necessary programs to support tenants. A Case Manager to assist with arrangements for services and supports upon request. "Nearly 12 percent of Boston's population has a disability, and we need new buildings like this to ensure all of Boston's residents have a home that meets their needs," said Kristen McCosh, Commissioner of the Mayor's Commission for Persons with Disabilities. "This development showcases Boston's work to include all members of our community in each and every plan the City develops." Today's groundbreaking builds on the recent release of Housing a Changing City: Boston 2030; Boston's latest quarterly housing report; and the Disability Taskforce Report, which highlight gains in stabilizing the housing market, accommodating housing growth, improving housing accessibility and increasing affordability. Since 2014, the implementation of the City's housing plan, 13,551 new units of housing have been created. With an additional 8,412 units currently under construction, the City has secured housing for an estimated 25,000 residents, making significant progress in meeting Boston's rapid population growth. "I'm a strong advocate for all efforts to facilitate more affordable and accessible housing in the Boston area-both because I see the need all the time among my community of people with disabilities, and because I recognize this need in my own life," said Carol R. Steinberg, an attorney, writer and speaker on accessibility issues, a member of the Massachusetts Architectural Access Board, past president of the Board of the Disability Law Center, and a member of the Government Relations Committee of the Massachusetts Multiple Sclerosis Society. "I thank all partners involved in this project for creating housing where those with disabilities can be both safe and independent." Total development cost for this new building is $15.4 million, and was made possible in part by a $2 million investment by the City of Boston; $750,000 from the Massachusetts Department of Housing and Community Development; $1 million from MassHousing; $1.2 million in debt from Capital One Bank and $9 million in equity financing from Capital One Bank and National Equity Fund. In addition, the project received a $200,000 grant from Capital One Bank and a $2.8 million contribution from The Boston Home.